The Institute for Energy and the Environment at Vermont Law School and The Network for New Energy Choices, a New York-based nonprofit organization, have just released a comprehensive report which reviews net metering laws across the U.S. 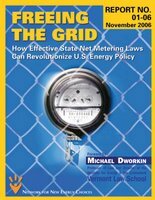 The report - Freeing the Grid, How Effective Net Metering Laws Can Revolutionize U.S. Energy Policy - concludes that state governments could be doing much more to encourage residents to install small clean generation sources, thereby reducing demand and easing the strain on an aging transmission system. The concept of net metering allows electricity customers connected to the grid to produce their own power - typically through renewable energy sources, such as small wind or solar power systems - and "return" unused power to the grid. If customers produce more power than they use, the customer is given a credit on their electricity bill (to be applied to a future bill, where the customer is unable to produce enough power on their own, and must draw energy from the grid). 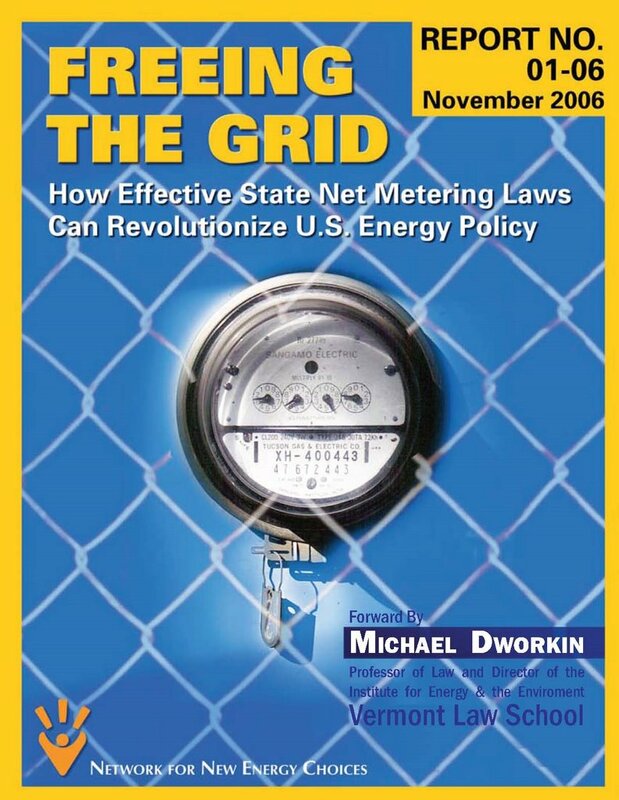 The authors of Freeing the Grid see state net metering programs as a critical component of achieving energy independence in the U.S. : "[b]y compensating customers for reducing demand and sharing excess electricity, net metering programs are powerful, market-based incentives that states can use to encourage energy independence." The report reviews and analyzes net metering laws in the 36 states that currently have them and gives a grade to each state's program, based on several criteria. The programs in Montana, California, Oregon, Nevada, Minnesota, Wisconsin, New Hampshire and New Jersey received an "A" grade; New Jersey's program received the top score, with Montana a distant second. You can use this map of the United States to see if your state has a net-metering law, and if so read the report on the effectiveness of the program. The report also includes a model net metering statute and regulations, created by attorneys at Vermont Law School's Institute for Energy and the Environment. The Burlington Free Press has more on the net metering report. The Renewable Energy Law Blog is brought to you by the law firm of Dunkiel Saunders Elliott Raubvogel & Hand PLLC. Our firm provides legal counsel to individuals, businesses, municipalities, and non-profits seeking to finance, permit, and develop renewable energy projects. Contact Dunkiel Saunders. Please contact Brian Dunkiel, Andy Raubvogel or Geoff Hand at Dunkiel Saunders. This blog is only intended to provide information, news and commentary on current events in the area of renewable energy development. It is NOT legal advice. Readers with specific legal questions are encouraged to contact an attorney. Information exchanged on this blog is open and available to the public and won't be treated in a confidential manner. An attorney-client relationship is not created by virtue of your access to, or use of this site, or any interaction that may occur through this site between users and Dunkiel Saunders Elliot Raubvogel & Hand. We take no credit or responsibility for the third-party information that may be accessed through this blog, and although we try to stay on top of things, we offer no warranties or guarantees as to the accuracy or reliability of the information on, or available through, this blog.